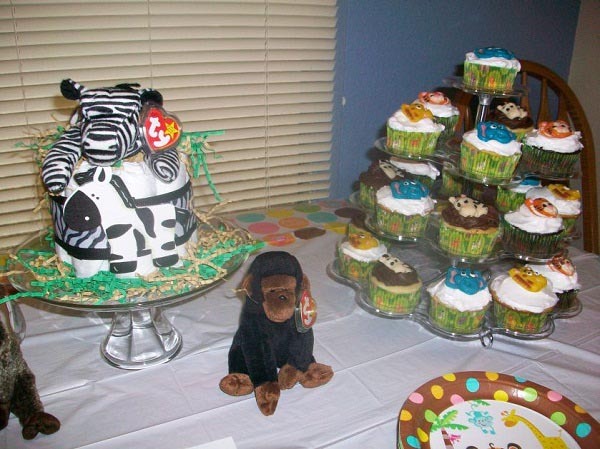 Real Jungle Baby Shower - see the photos and read the story! 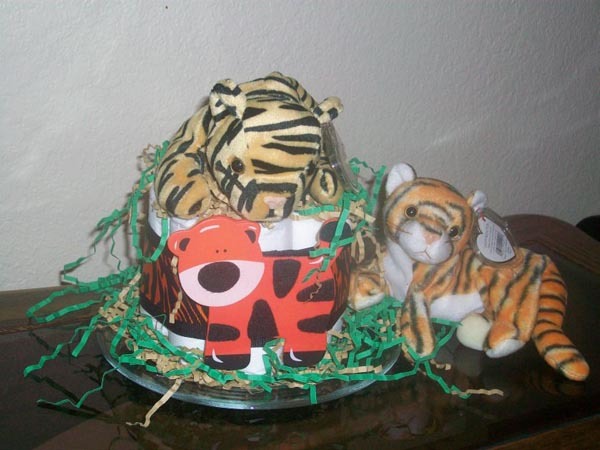 Read her creative ideas and find some inspiration for your own jungle baby shower! 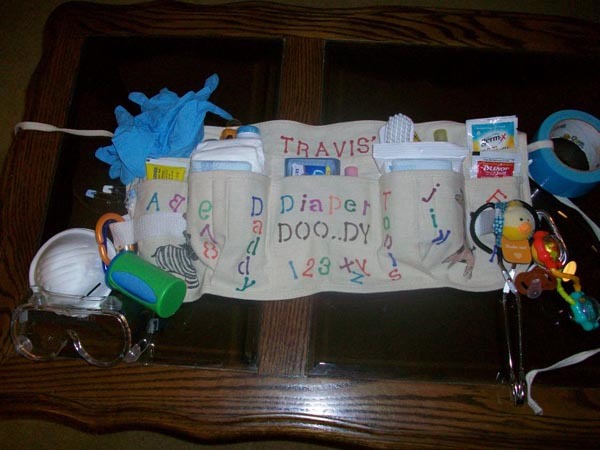 Tambra has really paid it forward to the rest of us by sharing her ideas, time and talents. We are so glad she did! 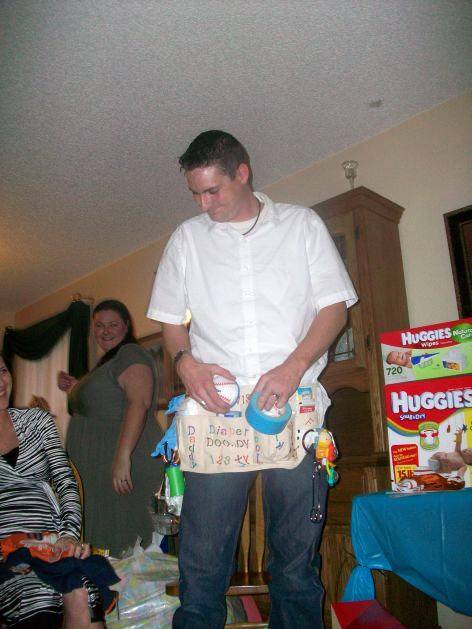 My son and daughter-in-law (DIL) are having a baby and his two sisters decided to give a couples shower. 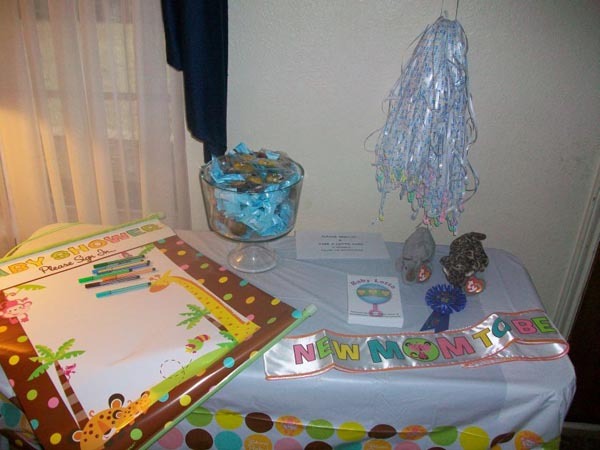 The baby shower was a HUGE success w/53 guests. 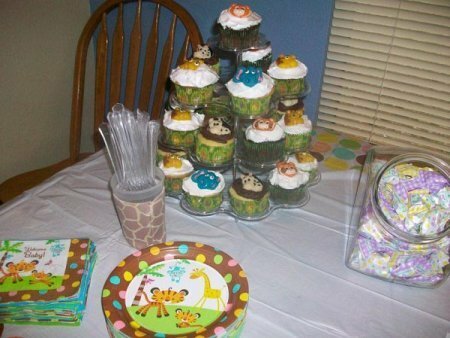 The theme was safari animals, especially giraffes. 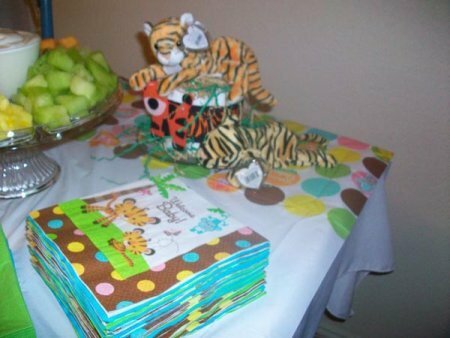 The girls chose the new Fisher Price's Rainforest Baby Shower tableware etc. and mixed in lime green and aqua solids too. 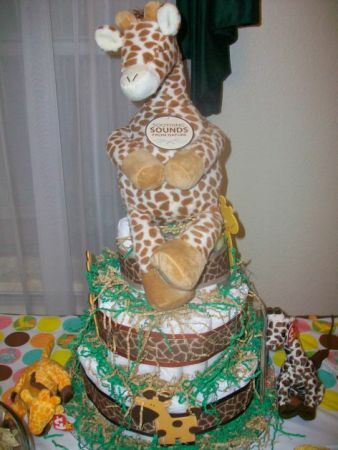 We made a 3-tier Gentle Sounds Giraffe diaper cake and then 2 1-tier Leopard & Tiger diaper cakes on each side. 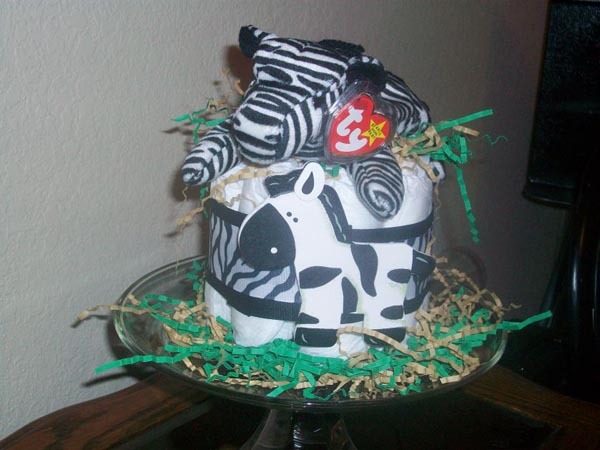 On the dessert table between 2 cupcake towers we made a zebra diaper cake. 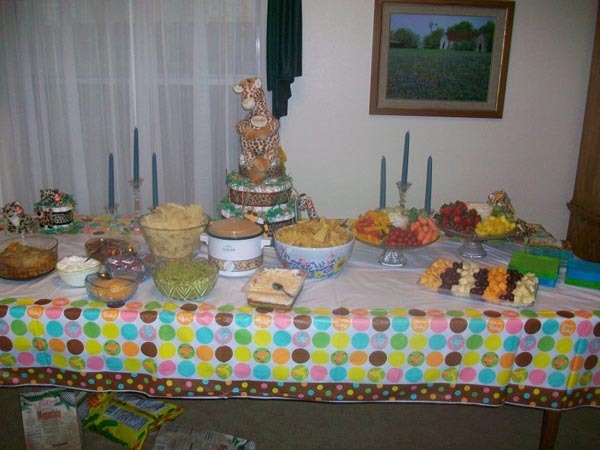 Since it was a couples shower they decided on Beef & Chicken Fajitas with all the fixings (tortillas, sour cream, tomatoes, salsa, guacamole and grilled onions & colorful bell peppers), 7 layer dip, queso & chips & we also had a fruit tray and veggie tray. 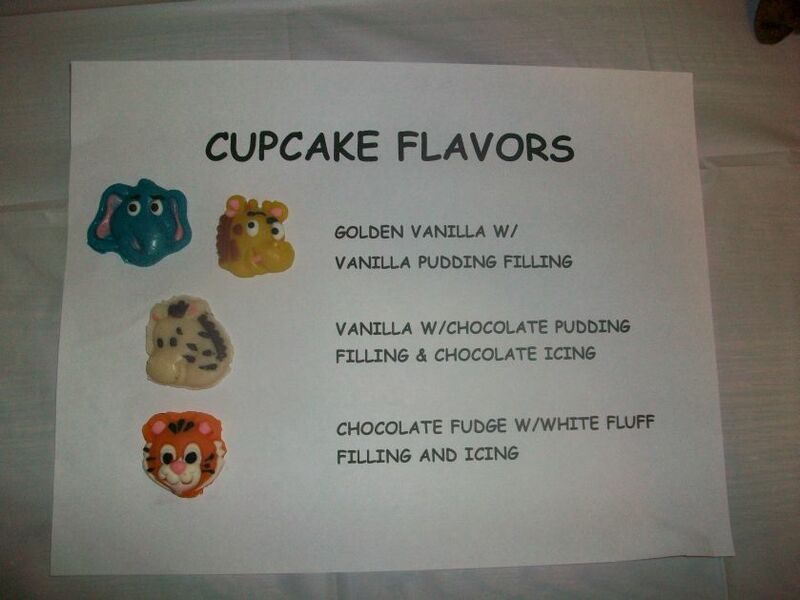 CUPCAKES was the dessert of choice 3 flavors, chocolate fudge w/white fluff center and icing & vanilla w/vanilla pudding center & white fluff icing and vanilla with chocolate pudding center and chocolate icing we used the Oriental Trading safari gummy candy to tell them apart. 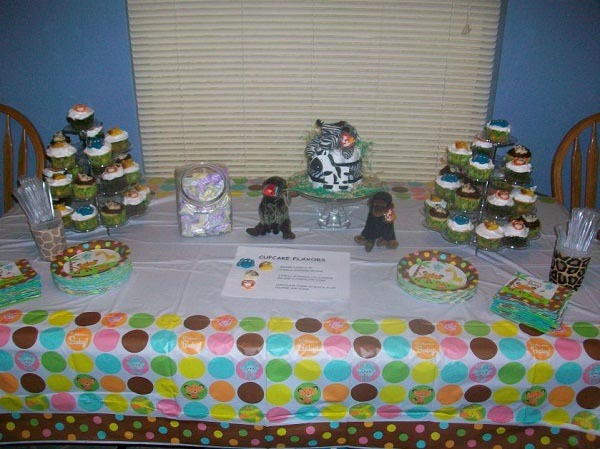 Beer, sangria, soft drinks and pineapple punch were the beverages that were offered. 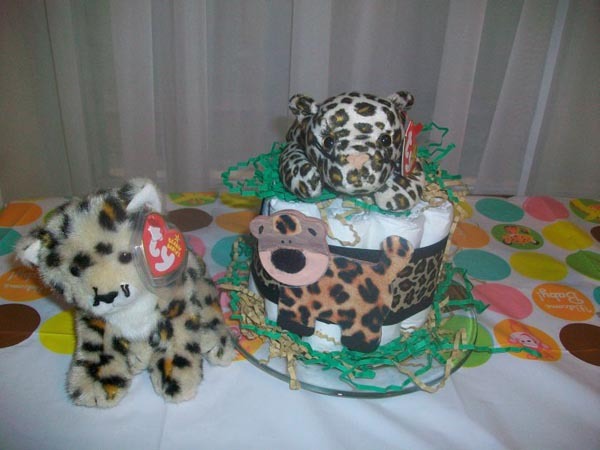 Fisher Price has a matching shower games kit with four games: Animal Baby Names, Word Scrabble, Word Search, and Shower Gift Bingo. 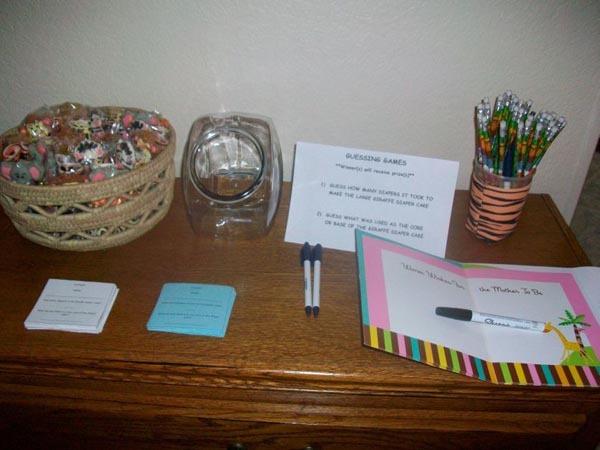 The bingo cards are blank and we used their registry items to fill in the cards. 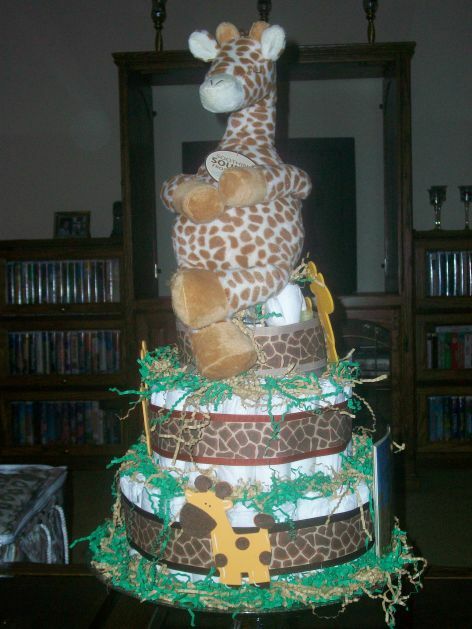 We also gave a prize for whoever guessed how many diapers it took to make the Gentle Giraffe Diaper cake AND what was used for the core base (a bottle of champagne). 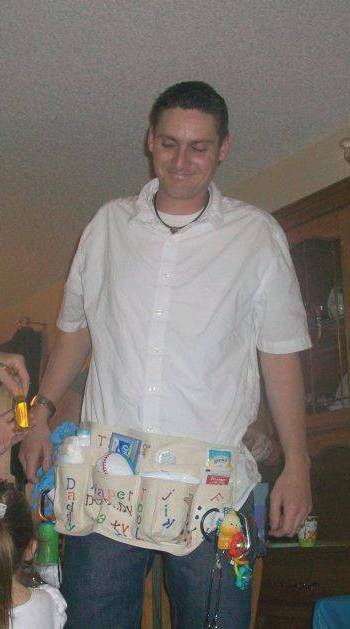 The fun part about the games is that guys loved these types of games. 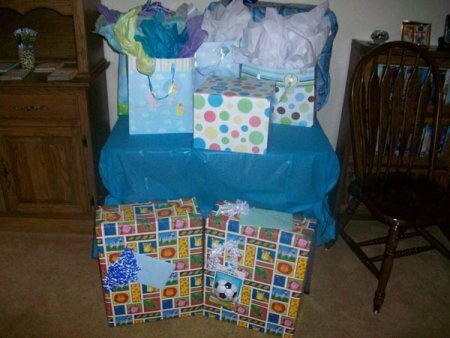 PLUS the Shower Gift Bingo kept everyone engaged while presents are being opened. 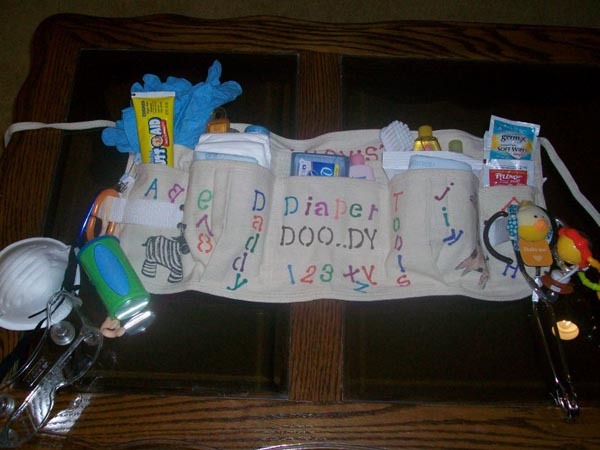 Prizes for the guys were mini flashlights & tape measures and for the girls book lights & mini tape measures. All were $1. 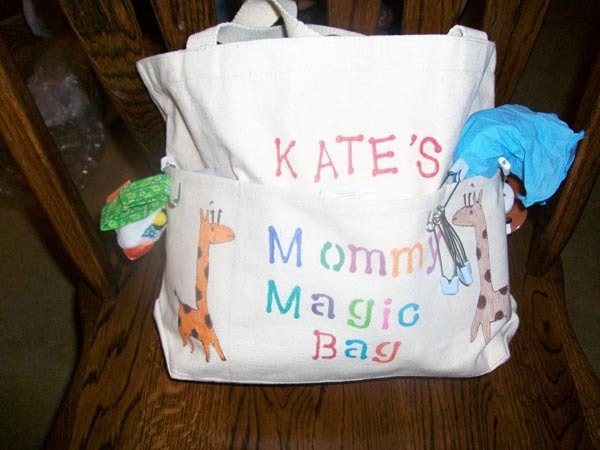 each at Dollar Tree & Harbor Freight and were wrapped in matching Fisher Price favor bags. 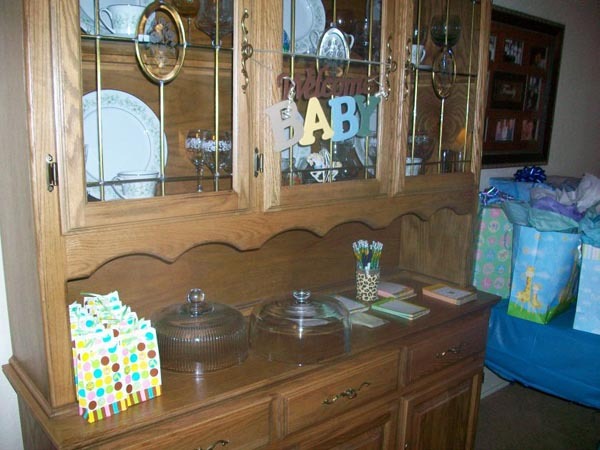 Oriental Trading Company was great for favors, decorations etc. 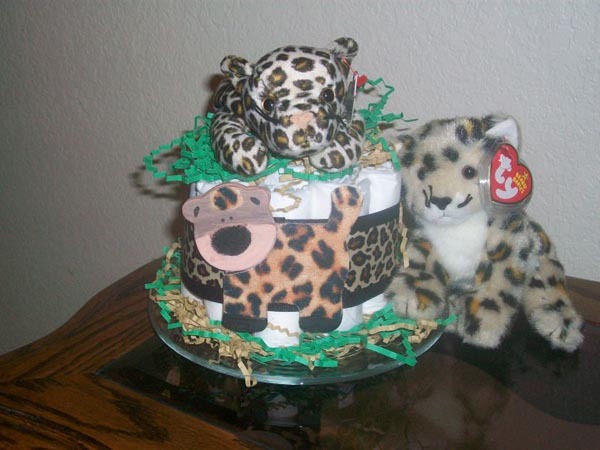 They have gummy safari animal heads for cupcake toppers, safari animal pencils, butter mint candies, and for favors we are giving safari koozies with giraffe, leopard, tiger & cheetah prints with safari animal suckers tied to them with curling ribbon. 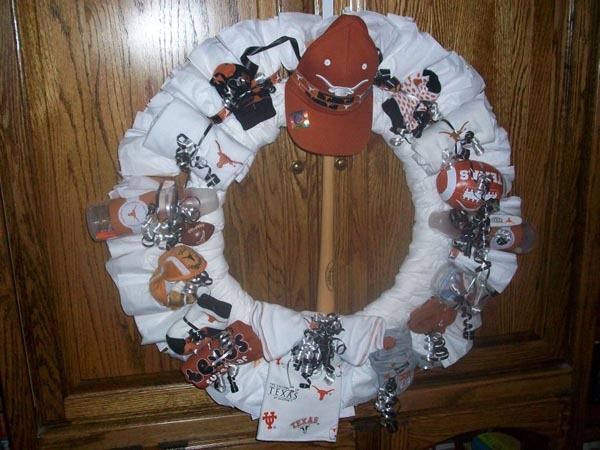 I went "crafty nuts" and made a UT Longhorn Diaper Wreath for my son filled with onsies, socks, bottles, pacifiers etc. 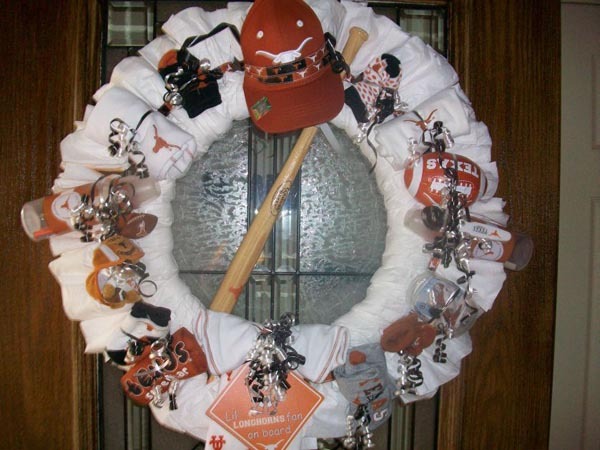 He is a huge Longhorn fan. 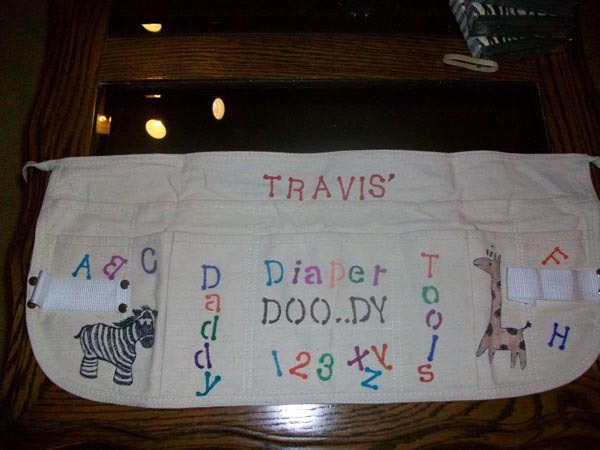 Also made him a "Daddy Diaper DOO..DY Tool Belt" as well as a "Mommy's Magic Bag" for his wife. 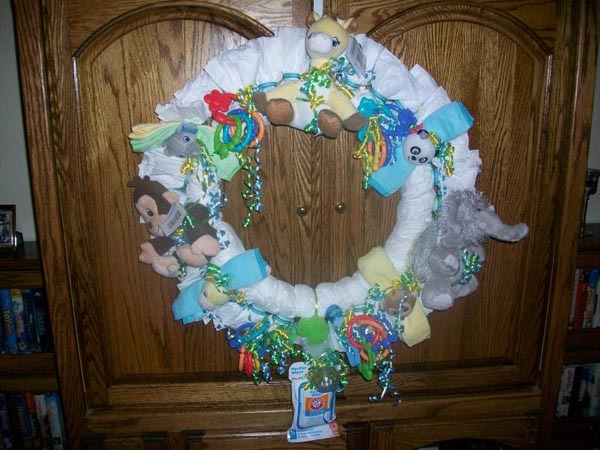 My daughters thought that the Longhorn wreath might get stolen @ the hospital so I also made a safari stuffed animal wreath for the hospital.